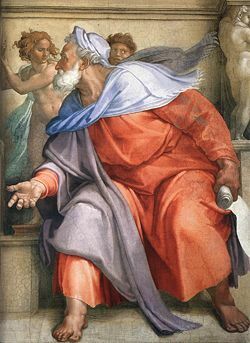 Ezekiel the Prophet, depicted in the 1510 Sistine Chapel fresco by Michelangelo. Ezekiel (592 to 570 B.C.E.) (Hebrew: יְחֶזְקֵאל—"God will strengthen") was a major prophet in the Hebrew Bible during the period of Jewish exile in Babylon. Ezekiel is remembered for various reasons. He is regarded as the author of much of the Biblical "Book of Ezekiel." He bemoaned the fate of Israel and Judah calling for a revival of faith centering on the hope of a rebuilt Temple of Jerusalem and reestablishment of the Davidic kingdom. As a prophet, he gave spiritual encouragement to the exiles by assuring them that the sins of their immediate ancestors would not be held against them (Ezek. 18). Additionally, he participated viscerally in his prophetic pronouncements through fasts and other mortifications of the flesh. His expressions of God's pain and anger are striking in the violent imagery that the prophet used to describe God's rage against Israel's idolatrous "fornication" (Ezek. 16, 23). More than any figure in the Old Testament, Ezekiel walked a conscious course of personal denial for the sake God and his people. No other prophet directly states that God has asked him to "bear the sin of the house of Israel." (Ezek. 4:5) He undertook excruciating self-mortifications as "sign acts," portraying in his person God's judgment on the community. Even his beloved wife—the "delight of his eyes"—was suddenly taken by God, and God commanded him not to mourn for her because his reaction was to serve as an example to the Jews regarding how to respond to the destruction of Temple of Jerusalem, which has also been carried out in accordance with God's providence. 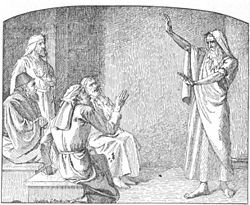 The exiled elders of Judah often consulted Ezekiel for guidance, although it is debatable whether his prophecies had much immediate impact on the exilic community. Nevertheless, his writings certainly became very important in later Jewish life. His prophecies outlined many of the central themes that defined the Jewish people in the post-exilic age. They spurred on both Jewish and Christian apocalypticism and messianic hopes. His marvelous visions of angelic beings (and their vehicles), found in Ezek. 1, 10, later became important elements in the mystical tradition of the Kabbala. Finally, his famous vision of the Valley of Dry Bones (Ezek. 37), although originally referring to the revival of Israel as a nation, became an important basis for the belief in the resurrection of the dead, both in Jewish and Christian traditions. Ezekiel was the son of Buzi, a priest of Jerusalem and descendant of Zadok. As such, he was probably among the aristocracy whom Nebuchadnezzar II carried off as exiles to Babylon in 597 B.C.E. He lived among a colony of exiles on the canalworks associated with the River Kebar, in a place called Tel-aviv, after which the modern Israeli city was named. Life for most of the exiles did not involve physical suffering or slavery. Ezekiel himself was married, lived in his own house, and entertained many prestigious guests. As a priest exiled from the Temple in which he could practice his craft, Ezekiel certainly suffered spiritually. He often engaged in ascetic practices and thought of himself as bearing the sins of his people. One of his main complaints against his countrymen was that they were too complacent and willing to adopt Babylonian customs. In the fifth year of his exile, sitting on the banks of the river, he received his prophetic calling together with his first recorded revelation. Several other dramatic visions of his are recorded in the Book of Ezekiel (see below). However, it would be a mistake to consider him mainly as a visionary. The primary focus of his ministry was to urge the exiles to repent of their sins and live in accordance with God's ways. He expressed considerable frustration with their response and also denounced the behavior of his countrymen still living in Judea. The elders of the exiles repeatedly visited him (chapters 8, 14, and 22). However, he was not satisfied with their response, calling them a "rebellious house" (Ezek. 25-8; 3:26-27, etc). He complained that, although they came in great numbers to hear him, they failed to take his words seriously (33:30-33). At one point he even refused to be consulted by them (Ezek. 20:3). Ezekiel's prophecies extended over twenty-two years. The Bible and rabbinic tradition say nothing of his death. However, the apocryphal Lives of the Prophets (not considered authoritative by either Jewish or Christian authorities) reports he was slain by a member of one of the tribes of Dan and Gad, who blamed him for cursing them and causing their cattle and children to die. I handed her over to her lovers, the Assyrians, for whom she lusted. They stripped her naked, took away her sons and daughters and killed her with the sword (Ezek. 23:9-10). Like Jeremiah before him, Ezekiel saw Babylon as the instrument of God's wrath against Judah on account of her sins. God's people were therefore not to resist their captivity, but to submit to the Babylonian yoke. Only repentance and obedience to God's laws would win their redemption. I will set up one shepherd over them, and he shall feed them, even my servant David; he shall feed them, and he shall be their shepherd. And I the Lord will be their God, and my servant David a prince among them; I the Lord have spoken it (Ezek 34:23-24). It should be remembered that in Ezekiel's day, the Davidic line of kings had only very recently been dethroned by the Babylonian power. Indeed, during the period of his early prophecies a Davidic king—Zedekiah—still reigned in Jerusalem over what remained of the Kingdom of Judah. For Ezekiel and his contemporaries, the idea of a revived Davidic monarchy was not, by any means, a supernatural one. Even though he held the nation collectively responsible for its sin, Ezekiel also strongly emphasized the idea of individual responsibility and rejected the idea of ancestral sin. He directly refuted the Deuteronomic teaching that God holds the sons responsible for the sins of their fathers for several generations (Deut. 5:9). The soul who sins is the one who will die. The son will not share the guilt of the father, nor will the father share the guilt of the son. The righteousness of the righteous man will be credited to him, and the wickedness of the wicked will be charged against him (Ezek 18:19-21). Also important to Ezekiel was the priestly tradition that he had inherited but could not practice in exile. Several of his prophecies deal with priestly concerns, especially the rebuilding of the Temple, which he describes in minute architectural detail. He envisioned the liberation of Israel from its Babylonian captivity and the redemption of its people to holy lives under the guidance of priestly teachers. He also prophesied vehemently against the non-Israelite peoples, such as the inhabitants of Ammon, Edom, Tyre, Sidon, and Egypt (Ezek. 25-32, etc.). Scholars debate exactly which of Ezekiel's prophecies are truly his own and which are the product of later writers that were attributed to Ezekiel. However, it is nearly universally acknowledged that a great number of the prophecies in the "Book of Ezekiel" are indeed his. I saw that from what appeared to be his waist up he looked like glowing metal, as if full of fire, and that from there down he looked like fire; and brilliant light surrounded him. Like the appearance of a rainbow in the clouds on a rainy day, so was the radiance around him. This was the appearance of the likeness of the glory of the Lord (Ezek. 1:27-28). Later God commands him to build a scale model of the Babylonian siege of Jerusalem and to lie on his side before it for 390 days, to "bear the sin of the house of Israel" (Ezek. 4:5). God commands Ezekiel to eat a scanty diet of bread cooked over a fire fueled with human dung. The prophet here contradicts the Lord, saying that to do so would violate his commitment to ritual purity. God relents, saying, "Very well. I will let you bake your bread over cow manure instead of human excrement" (4:15). I looked, and I saw beside the cherubim four wheels, one beside each of the cherubim; the wheels sparkled like chrysolite. As for their appearance, the four of them looked alike; each was like a wheel intersecting a wheel... Their entire bodies, including their backs, their hands and their wings, were completely full of eyes, as were their four wheels... Each of the cherubim had four faces: One face was that of a cherub, the second the face of a man, the third the face of a lion, and the fourth the face of an eagle (Ezek. 10:9-14). Later, God instructs Ezekiel to pack his things, blindfold himself, and dig through the wall of his house as a sign pertaining to the future captivity of the remaining Jerusalemites and their king, who would later be blinded and brought in chains to Babylon (Ezek 12). Ezekiel also reports a vision in which God predicts and even causes the sudden death of the prophet's wife. The word of the Lord came to me: "Son of man, with one blow I am about to take away from you the delight of your eyes. Yet do not lament or weep or shed any tears. Groan quietly; do not mourn for the dead..." So I spoke to the people in the morning, and in the evening my wife died (Ezek. 24:16-18). The reason for God's seemingly cruel treatment of his prophet, once again, is that Ezekiel is to act as a sign for God's people. As Ezekiel is to refrain from mourning for his wife, so the people are to refrain from mourning for the destruction of the Temple of Jerusalem. In both cases it is "the sovereign Lord" who brings the destruction—in the Temple's case on account of the nation's sin, and in the case of Ezekiel's wife to become a symbol. The proper posture in both cases is thus humility and obedience—not mourning. "These bones are the whole house of Israel. They say, 'Our bones are dried up and our hope is gone; we are cut off.' ...I am going to open your graves and bring you up from them; I will bring you back to the land of Israel" (Ezek. 37:11-12). Ezekiel's final vision is a long prophecy concerning the rebuilding of the Temple. It includes a detailed description, including architectural plans, dimensions, building materials, rooms for priests, ritual practices, festivals, priestly traditions, holy days, and the division of the land among the Israelite tribes (Ezek. 40-48). Ezekiel's personality strongly colors both his ministry and his prophecies. Nowhere else in the Bible are the personal experiences of the prophets described in such vivid detail as in Ezekiel. He takes his mission very personally and acts it out in dramatic fashion. Other prophets did likewise (Isaiah walked with in public for three years with his buttocks exposed, Jeremiah did not marry, and Hosea took a prostitute for a wife—all as symbolic acts related to their prophetic messages) but with Ezekiel, this prophetic acting-out seems to dominate his entire life. He conceives it as his prophetic mission to strive to reach his compatriots individually and to win them back to God; and he considers himself personally responsible for them. Yet, another feature of Ezekiel's personality is the pathological. With no other prophet are visions and ecstasy so prominent; and he repeatedly refers to symptoms of severe maladies, such as paralysis of the limbs and of the tongue (3:25-26). He also engages in graphic sexual imagery to portray God's frustration with his people, and describes God as a furious husband who responds to his wife's infidelity in violent rage. Feminist commentators consider him an example of a particularly virulent type of male chauvinism, while others have suggested that he may have been the victim of epilepsy, schizophrenia, or both. We can certainly recognize that the pressures of living in exile, engaging in long periods of fasting and other mortifications, and being suddenly widowed by what he believed was an act of God may have taken a psychological toll on Ezekiel. However, to write off his religious experiences as the mere product of psychosis is to ignore both his genius and his prophetic calling. In the end, we can only admit that, although he is clearly a troubled soul, he is also an inspired one. Ezekiel, like Jeremiah, is said to have been a descendant of Joshua by his marriage with the proselyte Rahab (Talmud Meg. 14b; Midrash Sifre, Num. 78). He was already active as a prophet while in Palestine, and he retained this gift when he was exiled with King Jehoiachin and the nobles of Judah to Babylon (Josephus, Ant. x. 6, § 3: "while he was still a boy"). Although his own descriptions imply the opposite, the rabbinical view is that Ezekiel beheld only a blurred reflection of the divine majesty (Midrash Lev. Rabbah i. 14). Jewish mystics, on the other hand, appeal to Ezekiel's visions of God, angelic beings, and the "heavenly chariot" as a guide to personal experience of the divine. The tradition known as merkavah kabbalah developed these themes in the early medieval period, claiming that a long line of Jewish mystics dating back to Ezekiel himself practiced this discipline. According to the midrash Canticles Rabbah, it was Ezekiel whom the three pious men, Hananiah, Mishael, and Azariah, (Shadrach, Miesheck, and Obednigo in Christian tradition) asked for advice as to whether they should resist Nebuchadnezzar's command and choose death by fire rather than worship his idol. At first God revealed to the prophet that they could not hope for a miraculous rescue; whereupon the prophet was greatly grieved. But after they had left the house of the prophet, fully determined to sacrifice their lives to God, Ezekiel received the revelation that God would indeed protect them from their fiery ordeal (Midrash Canticles Rabbah vii. 8). 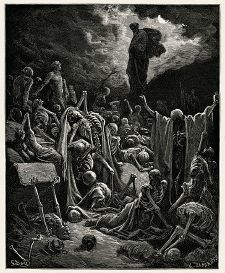 One tradition holds that Ezekiel literally performed a miracle of resurrecting the dead in the Valley of the Dry Bones, based on the passage: "So I prophesied as he commanded me, and breath entered them; they came to life and stood up on their feet" (Ezek. 37:10). As early as the second century, however, some authorities declared this resurrection of the dead was a prophetic vision. This opinion was regarded by Maimonides (Guide for the Perplexed, II: 46) and his followers as the only rational explanation of the Biblical passage. Ezekiel's name does not appear in the New Testament. However, his prophecies influenced Christian tradition in several ways. Ezekiel was the first prophet to make extensive use of the term "son of man" (ben adam) to refer to his role. Jesus also used this term to describe himself. The apocalyptic sayings of Jesus also may have been influenced by Ezekiel's visions, although they show more direct influence by the Book of Daniel and other Jewish apocalyptic literature. Ezekiel is sometimes cited as Old Testament support for the resurrection. Also, the Book of Revelation describes a scene similar to one mentioned by Ezekiel—a vision in which the prophet eats a scroll given to him by a heavenly being (Ezekiel 1; Rev. 10:9). This same book also contains several visions reminiscent of Ezekiel's as well as a description of the New Jerusalem and its Temple, both of which themes Ezekiel developed in detail. A major difference between the two is that Ezekiel's Jerusalem and its Temple are clearly physical in nature, while John's are usually understood to exist in the Heavenly realm only. And (remember) Ismail (Ishmael) and Idris (Enoch) and Dhul-Kifl, all were from among those who observe patience (Surah 21: 85-86). ↑ E.L. Altschuler, "Did Ezekiel Have Temporal Lobe Epilepsy?," Arch Gen Psychiatry (2002), 59:561-562. Machinist, Peter. Prophets and Prophecy in the Ancient Near East. Society of Biblical Literature. Society of Biblical Literature, 2003. ISBN 158983027X. This page was last modified on 28 January 2019, at 16:43.